Located in the center of Granadas capital, Hostal Navas 14 provides superb service with comfortable and fully equipped accommodation. Great location, clean and quaint room. Paco works very hard at the front desk and the restaurant to make sure there is always somebody there. He is very helpful and amazing to practice Spanish with! Friendly and helpful staff. It was funny the employees at the reception was sleeping snoring during the night even though it&'s 24 hours! Perfect location for visiting Alhambra, The Catredal ect. Cozy bed, really clean rooms, I got my room cleaned - new soap, clean towel. Nice staff - really helpful. Lots of nice bars, restaurants just in front of the hostel. The room was beautiful and clean. effortless to access to all landmarks. We got our dates wrong and arrived earlier than we had initially booked for, but the staff were very accommodating anyway and gave us a great room on the top floor with a massive balcony. 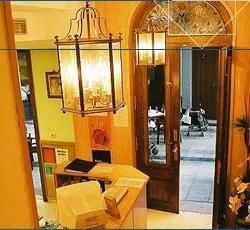 The hostel has its own restaurant and is situated on a busy street full of very good but expensive restaurants. * Hostal Navas 14 rated 4.11 out of 5 based on 9 customer reviews. Hostel reviews with a star rating are sourced from HostelBookers. If you find Hostal Navas 14 with the same booking conditions at a lower rate somewhere else on the internet after you have booked, we will refund you the total difference.